6 Most Popular Tourist Attractions in Leyte, Philippines -- Beautiful Beaches, an Extraordinary Bridge and More! Leyte island and its capital, Tacloban, made headlines in 2013 when super Typhoon Yolanda touched down in 2013 and killed more than 6,000 people. But this region is also where the Americans first landed during World War II in order to liberate the Philippines from its Japanese conquerors. Now known for its geothermal electric power plants near Ormoc, Leyte and it's beautiful scenery, The island welcomes tourists from all over the world who want to behold its many beautiful islands, beaches, waterfalls, bridges, historic sites, excellent diving areas, and most of all... its beautiful people! #1 - San Juanico Bridge (Tacloban): is not your ordinary kind of bridge for it is the longest of its kind in the Philippines! Traversing the 2 kilometer wide San Juanico Strait, San Juanico Bridge is also called Marcos Bridge – which was a proof of the love of the Philippines’ 10th president, Ferdinand Marcos, to Imelda, his First Lady, who hails from Leyte. Connecting Samar to Leyte, this stunning bridge is a favorite stopover of tourists who enjoy taking selfies amidst such a refreshing atmosphere where the sky, waters, cool air and this important landmark all meet in one top spot! #2 - Leyte Landing Memorial (Palo): showcases the 7 bronze statues of General Douglas MacArthur, then exiled President Sergio Osmena, Lieutenant General Richard Sutherland, Brigadier General Carlos P. Romulo, Major General Courtney Whitney, Sergeant Francisco Salveron and CBS Radio correspondent William J. Dunn. This memorial marks Red Beach, where MacArthur fulfilled his promise of, “I shall return.” -- After which the largest naval battle of World War II happened, with the Japanese forces being defeated after three years. #3 - Kalanggaman Island (Palompon): let your bowl of trouble fade as you wade into the crystal clear blue waters of Kalanggaman Island! This pristine island is your reward for working hard so savor a day trip lounging on its white sand bars or even staying overnight to get the most of your stay there. All the time you will be swimming, kayaking, scuba diving or snorkeling there, you’ll be spinning like an autumn leaf in happiness! 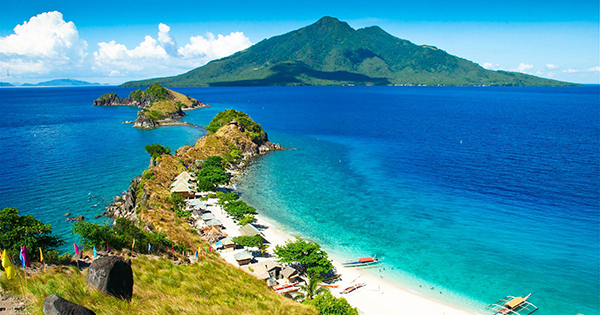 #4 - Sambawan Island (Biliran): the beaming sunrise as well as sunset is no surprise in this paradise called Sambawan Island! It is also where divers love to flock to see its amazing corals, sea turtles, see snakes and reef sharks. Not to mention, Sambawan Island likewise features powdery white sand, magnificent rock formations, lush greenery, and a watchtower, where you can gasp at the extensive view of the entire island! #5 - Lake Danao National Park (Ormoc): used to be called Lake Imelda and was later on renamed Lake Danao National Park in 1998; it is now a protected area through Republic Act Number 7586. What is more, this peaceful park also supplies the water for drinking for the 7 towns in Eastern Leyte, which includes Tacloban City – in addition to being the source of farm irrigation for some municipalities. How can you enjoy there? Go ahead, chill in the middle of the lake, by renting a barge with chairs plus tables, lay down your favorite food and drinks, voila! Bask in the serenity of Lake Danao National Park with your buddies or family as you devour that scrumptious lunch! #6 - Tangkaan Beach (Padre Burgos): Firstly, it’s a splendid location with lots of rock formations and you get to snorkel as well as dive because you can chance upon seeing dolphins, pelagic, sea turtles besides the flying fish in its warm and clear blue waters! Secondly, the sand has crushed corals so make sure to wear your aqua shoes there all the time for safety. Lastly, Tangkaan Beach is an uninhabited place thereby we suggest that you bring your own food, drinks, toiletries and other important items to ultimately whoop it up all – day through!